Spinal decompression is a non-invasive, non-surgical treatment for acute and chronic back pain related to disc conditions. Mechanical decompression works by slowly and gently stretching the spine, taking pressure off compressed discs and reducing pressure on the spinal nerve roots. The most common condition treated with spinal decompression therapy is a bulging disc or herniated disc. With a disc herniation, compression of the spine during normal daily activities causes the herniation to expand, putting pressure on surrounding spinal nerve roots. Spinal Decompression treatment takes the pressure off these damaged discs so that the disc bulge or herniation will shrink back closer to its original size removing pressure on the delicate nerves. Degenerative disc disease is also a common condition treated with spinal decompression therapy. Reduction of disc height can be exacerbated by spinal compression, causing the vertebral bodies to move closer together. This can cause nerve compression and other forms of common back pain. Decompression eliminates the overwhelming pressure on degenerated discs reducing or eliminating painful symptoms. Spinal decompression is the single most exciting treatment developed in many years for pain related to disc conditions of the spine. Troy Chiropractic has partnered with Axiom Worldwide to bring this exciting treatment to you. 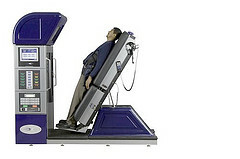 We are the only office in Troy that can offer true spinal decompression therapy with the DRX9000. If you are not being treated with a DRX system then you are not receiving true spinal decompression. At Troy Chiropractic we have utilized the DRX9000 spinal decompression system since 2004 in our St. Peters location, and we have offered this service in TROY since 2011. Since then our office has enjoyed a 90% success rate treating degenerated, bulging and herniated discs. If you want to avoid back surgery or painful injections then spinal decompression with the DRX9000 is an excellent option for you.